Münster, 10.04.2019 - The countdown has begun! In just two and a half months, the European Championships of Skateboarding will take place from 20.-23.-06.2019 as part of the Ruhrgames. The best skateboarders in Europe will compete within a unique factory set- ting at the Duisburg-Nord Landscape Park. In addition to the contest, side events will take place such as the „Visual Vacation – Celebrating European Skateboard Media“ evening event, „ Secret Spot Mission“ with 1.500€ cash for tricks and the „Evil Knievel Challenge“. Over 40 skaters have already confirmed their participation and top pros from across Europe are added each day. Those not yet qualified or invited can register now on the Euro-SB website and take part in the pre-qualifi- cation on 21.06.2018. A world-class judge panel including Pat Duffy, Jeremie Daclin, Martin Karas, Flo Marfaing and Mirko Holzmüller ensures that skaters are judged accurately and fairly. Llega la semana Santa y con ella la XI edición del campeonato de skate ¨El Bollo de Avilés¨: sábado 20 de abril a partir de las 12:00h en el polideportivo de la Magdalena. Mucho skate, engorile, música y buen ambiente. 725 euros en premios en metálico a repartir entre los 5 mejores clasificados de la categoría 17-34 años y un montón de material para las demás categorías. Premio ¨Never Stop Best trick¨ en el Bowl. Danny Leon has been one of the best bowl riders so far, so his time has arrive to join the PRO status for Jart Skateboards. Enjoy this clip he made with love and hard work, congrats Danny! The latest collection from Vans’ global skate team rider Lizzie Armanto has finally sprung. With the super bloom season exploding with eye-catching and colorfulflowers, it’s only natural for Lizzie’s new collection to blossom in a beautifullavender pack featuring the Vans Slip-On Pro, Sk8-Hi Pro and matching apparel to complement. Lizzie’s vibrant aesthetic and love for skateboarding has inspireda collection made for women to feel comfortable and boldly push forward. added rubber ollie pad for increased protection, Lizzie’s endorsed colorways also reveal reflective checkerboard detailing on the foxing stripe that binds the shoe together. While traveling in Asia, Lizzie became enamored with the traditional Japanese“Maneki-neko” cat that symbolizes good luck and knew it had to be incorporated in this collection. Both the Vans Slip-On Pro and Vans Sk8-Hi Pro have goodfortune detailed in the sole and Lizzie’s own personal initials embroidered ontothe heel counter. The Sk8-Hi Pro continues to bring her aesthetic to life with the top eyelet shaped as a flower, custom made for Lizzie. Designed with movement in mind, Lizzie’s apparel collection is both stylish andfunctional. The Lizzie Body Suit provides a breathable cotton elastane material covered with an all-over checkered print, that stays tucked in for optimal skate activity. The Lizzie Raglan Hoodie is the perfect pullover for warming up before a skate session. With a relaxed fit that keeps comfy looking fresh, the striking lavender-toned colorway and Lizzie’s embroidered signature makes this anessential to the outfit. Finally, the Lizzie Skate Pack keeps all the travel essentials tucked away in a backpack perfect for traveling with two main compartments ideal for tech storage, skate gear and other knick knacks. Part of the Vans global family since 2014, Lizzie Armanto has paved her own path, boasting several contest wins and acclaimed video parts along the way. Staying true to the Vans DNA, Armanto has emerged as an icon of originality and an inspiration to aspiring skaters across the globe. When she’s not traveling or ather local skatepark, Lizzie continues to make her mark in skateboarding history by becoming the first woman to complete the infamous Tony Hawk loop in late2018. Vans’ collaboration with Lizzie aligns with the brand’s commitment toenable and empower women skateboarders around the world. The Vans x Lizzie Armanto Collection is available online and in-stores across Europe now. Almost Skateboards introduces Max Geronzi as the new pro member to the the team, congrats Max! El próximo sábado 23 de marzo, en Utopía 126, las mujeres tendrán un espacio en el que disfrutar de clases de skate, exposiciones artísticas, talleres y otras actividades relacionadas con el patín totalmente gratis. La experiencia «GIRLS SKATE CAMP» se enmarca dentro de la nueva campaña«Vanguards» con la que Vans mantiene su compromiso con el skate para que este crezca y perdure. Se trata de una exploración de cómo el estilo, la individualidad y la creatividad conforman el skate a través de la perspectiva de sus riders internacionales Lizzie Armanto, Yndiara Asp, Brighton Zeuner y Mami Tezuka. «La identidad de nuestra marca se inspira continuamente en personalidades como las mujeres que conoces en la campaña Vanguards», afirma Erwin Federizo, director creativo ejecutivo global de Vans. Las clases de skate gratuitas son el plato fuerte de la jornada, disponibles para todas las niñas y mujeres que se inscriban. Pero «GIRLS SKATE CAMP» también ofrecerá distintos talleres DIY (Hazlo tú mismo) como la customización y construcción de tablas y la creación de chapas personalizadas; además podrán disfrutar de la proyección de auténticos videos de skate, una exposición de las fotografías y música a cargo de DJ. Virginie para amenizar la jornada. Incluir nombre, apellidos, edad, número de teléfono y DNI en el cuerpo del correo. *50 plazas disponibles por inscripción. Foundation Skateboards welcomes Victor Aceves to the team with this gnarly clip, check it out! Axel Crusher destroys everything in his path. Here is just a little taste of whats to come in the next Toy Machine's feature full length "Programming Injection" coming soon. Axel Cruysberghs | Welcome to Toy Machine! NB Balance Numeric releases a dope edit Introducing the NM379 colours by Tom Karangelov, Jake Hayes, Flo Mirtain and Marius Syvane. Enjoy some sick skating! NB 379 from New Balance Numeric on Vimeo. In 2019, DC Shoes honors a true brand icon and pioneer of modern street skating with an all new Kalis S. Fully equipped with unmistakable design DNA, this reinterpretation of a classic seamlessly blends our heritage with our future. It’s a collision between original style and modern technology. Brandon Westgate and New Balance Numeric head designer Jeff Mikut sit down to discuss the design process of the 913 and take the shoe for a test. They created a really awesome shoe! From the depths of Estonian winter, watch relative unknown Liam Pace edge out Greyson Fletcher to take the title to the USA. Watch a full highlights edit featuring Finland’s Jaakko Ojanen, Americanss Carsten Boyer and Kechaud Johnson, Joseph Garbaccio of France, Italian styler Ivan Federico, Spaniard Jaime Mateu, France’s magnified man-of-the-moment Aurelien Giraud, Brazilian gentleman Luiz Neto and relative unknown Liam Pace, alongside Tony Hawk and Bam Margera among others. It’s with a tip of the hat that Cairo Foster retired from professional skateboarding. He could have milked it, he could have coasted but he wanted to walk away on his terms. One more reason Cairo is a legend. Enjoi proudly sponsored Cairo for over a decade and he will be forever part of the enjoi family. Cairo, you are truly one of the greats!!! Thank you! Converse CONS is proud to announce Alexis Sablone as the latest addition to their skate team. Alexis has big things in store for 2019 and they are endlessly excited in welcoming her to the CONS Family. 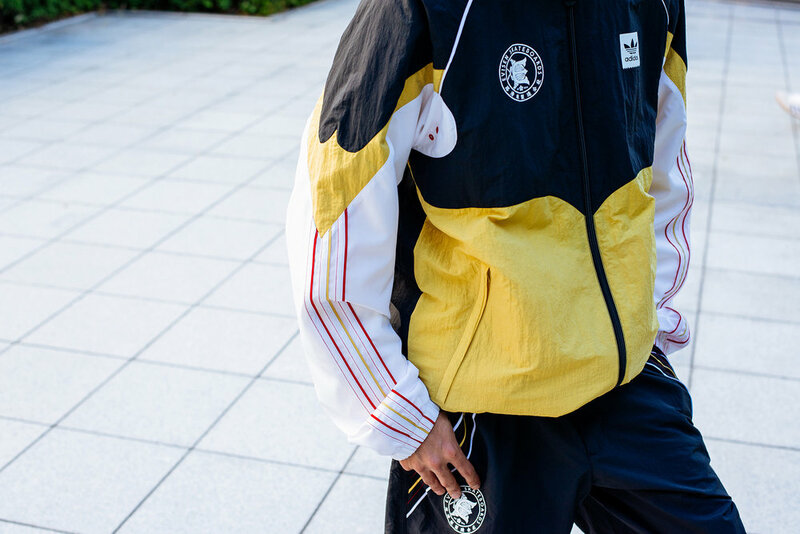 adidas Skateboarding reveals its latest capsule collection with Tokyo-based skate brand, Evisen. A curated clash of east meets west, the collaborative effort debuts a strong collection of essential silhouettes for any season, while incorporating Japanese design details with street and sportswear cues. The 5-piece apparel and footwear collection is designed with functionality and practicality built into each product. Co-created with adidas Skateboarding and Evisen, the capsule’s apparel offering includes a heavyweight fleece crewneck, a vibrant cotton tee with sleeve graphics, a woven pique fabric jersey with a water repellent finish, a nylon relaxed fit track pant, and a lightweight, water repellent jacket. The collection will also feature a custom 3MC shoe, redesign to align with the aesthetics of the Tokyo-based board brand. The Evisen 3MC features a durable leather upper constructed to withstand skate-related abrasion and a vulcanized rubber HexFlex outsole that follows the foot’s natural movement. The clean and minimalistic sneaker design comes in an all white colorway paired back with subtle red and yellow detailing. Converse CONS INTRODUCING THE LOUIE LOPEZ PRO. Curated and detailed by Louie from Converse’s archival best – classic athletic looks matched with grip and feel – this is the common thread that laces it all together. Past and future; competitive and casual; high status and lo-pro… just what you’d expect from Louie’s first pro shoe. ¡Esta Navidad, Skate Agora Camps! Del 27 de diciembre al 5 de enero, con la excepción del 31 de diciembre y del 1 de enero que Skate Agora Academy permanecerá cerrado. Disfruta del skate y aprende con los mejores Pro riders en el único skatepark homologado por Street League Skateboarding en Europa. Los Skate Agora Camps de Navidad transcurrirán en horario de mañana, de 10.00h a 14.00h. ¿Qué incluyen Skate Agora Camps? New Balance Numeric and Al Carrer Skate Shop Barcelona joins forces to launch a long sleeve football shirt. For this project, NB # invited the store to meet in Oporto, Portugal. Where they spent 3 days skating, enjoying new spots and they ended up attending a Champions League match at the Estadio do Dragao, FC Oporto! Al Carrer | Proudly Welcomes J……..